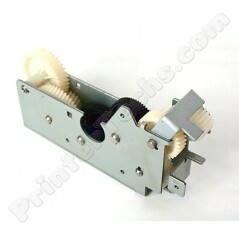 Main gear drive assembly (refurbished) for HP Laserjet 4 Plus or 5. Main gear drive assembly (refurbished) for HP Laserjet 4-Plus and 5. If you notice teeth are missing from the drive gear in your printer which couples with the fuser gear, you need this part. Missing teeth on this main gear drive will cause the fuser to stop rotating continuously and paper will jam as it enters the fuser. NOTE: This assembly will not work in the Laserjet 4 or 4M. See alternate assembly for that model.